YooHoo & Friends was first introduced to the marketplace by Aurora World Inc. in 2006 as a line of plush animals. The YooHoo & Friends characters feature big eyes, long, fluffy tails and are based on animals (many endangered) from around the world. The YooHoo & Friends 2D animated cartoon series stars rap legend Flavor Flav. The ‘WannaBes’ (5”, MSRP: $9) are some of the most popular items in the YooHoo & Friends line. For 2012, Aurora added jungle and domestic/barnyard assortments including a giraffe, elephant, lion, tiger, horse, cow, cat and dog. Each makes a fun sound when squeezed and sports a removable hoodie for added play value. First I want to say I received the cow ‘WannaBes’ and I have to say that this little blush is so darn cute. It makes cow sound and I know it sports a removable hoodie but really like the hoodie on it. 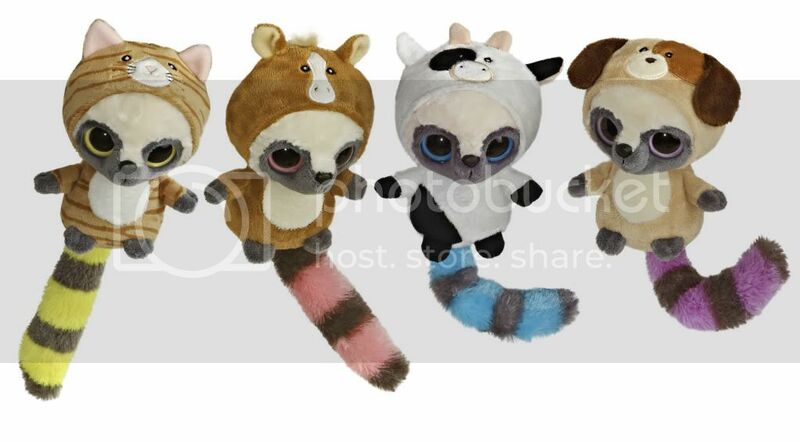 Like I said these are very cute and even if you do not have children but love collecting plushies I think this is a awesome product. There is a interactive entertainment website www.yoohoofriends.com, which is super fun . There are games ,wallpapers and colouring pages. I would give it to my little man, he'd really enjoy it. I would keep it for myself. =) I collect them.